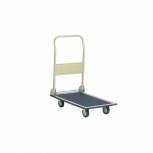 Single-Ended Platform Truck 371755 Pack of 1 Firm loading platform truck. Optional extra end and shelf available (see SBY27543 and SBY27542). Waterproof finish plywood platform. Overall size: W600 x D1000 x H1020mm. Capacity 400kg. 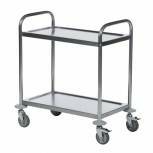 Economy Stainless Steel 2-Shelf Trolley 375608 Pack of 1 Manufactured from stainless steel. Two pressed steel shelves. Rubber tyred swivel castors. Easy assembly. Capacity 100kg. 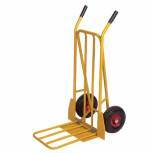 Yellow General Purpose Sack Truck With Folding Footplate 382848 Pack of 1 Fully welded tubular steel construction. Capacity: 250kg. Overall size: H1120 x W560mm. Fixed footiron and extra large folding footiron. Mounted on 260mm diameter pneumatic tyred wheels. Weight: 13kg. Finish: epoxy powder coated yellow. Non returnable. 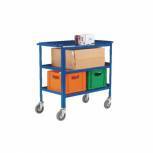 VFM Silver Platform Truck Four Sided 1000x700mm 376420 Pack of 1 Heavy duty tubular steel welded truck with plywood platform, sides and ends. Platform size: L1000 x W700mm. Platform height: 260mm. Handle height: 900mm. 2 fixed & 2 swivel 200mm diameter braked rubber tyred castors. Capacity: 500kg. Non returnable. 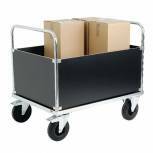 VFM Black /Grey Folding Shopping Cartridge With Lid 383360 Pack of 1 Durable moulded construction with rubber tyres for easy manoeuvrability. Folds up for compact storage. Easily sets up from folded position. Supplied with a lid for extra convenience. W360 x D410 x H430mm. Colour - Black/Grey. 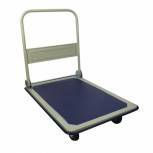 GPC Folding Lightweight Trolley GI002Y Pack of 1 Designed with a flat base made from pressed sheet steel, covered with non-slip, non-marking PVC surface. 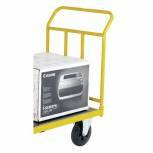 The trolleys fold and unfold in seconds and can be stored in a limited amount of space. Maximum load 150kg. Single End For Platform Truck Yellow 371758 Pack of 1 Single End For Platform Truck Yellow 371758 Optional extra end and shelf available. Waterproof finish plywood shelf and platform. Epoxy powder coated finish. Overall size: W600 x D1000 x H1020mm. Capacity: 400kg. 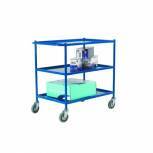 VFM Service Trolley 3-Tier With 150mm Castors Blue 306749 Pack of 1 3-fixed tiers, open on one side for easy clearing. Push handles fitted at both ends. Capacity-150kg. Height between tiers - 250mm. 4x150mm diameter rubber tyred swivel castors. Dimensions - L1250x W530xH910mm. Non returnable. 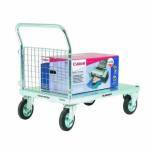 VFM Service Trolley 2-Tier With 125mm Castors Blue 306750 Pack of 1 Capacity - 150kg. 2-fixed tiers. Tray base size-840 x 460mm. Height between tiers-480mm. Four 125mm diameter rubber tyred swivel castors. Push handle at both ends. L1040x W480xH900mm. Colour - Blue. Non returnable. VFM 3-Tier Service Trolley 813x508mm Blue 306759 Pack of 1 Mild steel with blue powder coated paint finish. Easy to clean corners. Capacity: 150kg. Handle fitted at one end. 4 x 125mm diameter rubber tyred castors. Height: 932mm. Height between tier: 330mm. Tray size 813x508mm. L983 x W619mm. Non returnable. 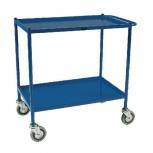 Service Trolley 2-Tier 747X432mm Blue 306761 Pack of 1 Mild steel. Easy to clean corners. Capacity 150kg. Handle fitted at one end. 4 x 125mm diameter. Rubber tyred castors. Height 881mm. Height between tiers 580mm. Tray size - 747x432. L906 x W543. Height between tiers 580mm. Non returnable. 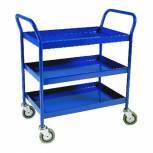 VFM Service Trolley 2-Tier 813x508mm Blue 306762 Pack of 1 Mild steel. Easy to clean corners. Capacity 150kg. Handle fitted at one end. 4 x 125mm diameter. Rubber tyred castors. Height 881mm. Height between tiers 580mm. Tray size - 813x508. L983 x W619. Height between tiers 580mm. Non returnable. 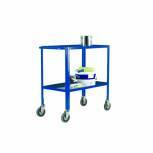 Service Trolley 3-Tier Fixed Blue 306764 Pack of 1 Fixed Tray Trolley. Capacity - 150kg. 4 x 125mm diameter. Rubber tyred castors. Tray size - 750 x 470mm. Overall L900 x W535mm. Between tiers - 250mm. Weight 24kg. Colour - Blue. Non returnable. 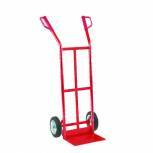 Red General Purpose Hand Truck Pneumatic Tyres 308074 Pack of 1 Recessed crossbars for carrying sacks but equally suited to handling cases etc. Knuckle protection handgrips. H1145 x W545mm. Footiron length - 200mm. 260mm diameter pneumatic tyred wheels. Weight - 12.5kg. Capacity - 250kg. Non returnable. 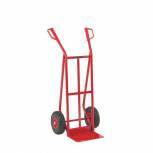 Red General Purpose Hand Truck Foam Tyres 308075 Pack of 1 Recessed crossbars for carrying sacks but equally suited to handling cases etc. Knuckle protection handgrips. H1145 x W545mm. Footiron length - 200mm. 260mm diameter pneumatic tyred wheels. Weight - 12.5kg. Capacity - 250kg. Non returnable. 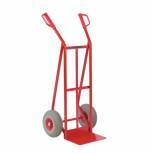 General Purpose Hand Truck 125kg Red 308076 Pack of 1 Tubular steel construction with knuckle protection hand guard. Straight crossbars with central brace. 200mm diameter rubber tyred wheels. Footiron length - 200mm. H1145 x W545mm. Weight - 11.5kg. Non returnable. 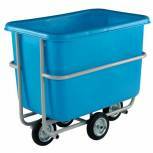 Mobile Tapered Container Truck 308367 Pack of 1 Tubular steel frame with low density polyethylene body. 200mm diameter cushion tyred wheels, giving excellent manoeuvrability. 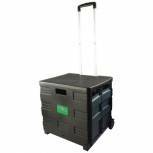 Capacity - 180kg. Weight - 27kg. Dimensions L900 x W590 x H790mm. Capacity 249 litres. Non returnable. 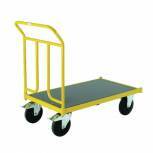 Platform Truck Premium 1 Push Handle 308459 Pack of 1 Heavy duty welded trucks with folded sheet steel platforms. Large 600kg capacity. Internal height of sides - 420mm.Platform height - 288mm. 2 fixed and 2 swivel 200mm diameter rubber tyred castors. Overall L1063x W700mm. Single mesh end. Non returnable. 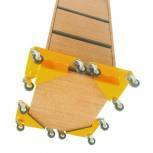 Corner Bogie Set of 4 Yellow (Pack of 4) 308514 Pack of 1 Easy to position - lift one side of load and slide in bogie. Ribbed rubber load platform. Load height - 38mm. Unit size - 300 x 300 x 90mm. Load capacity - 500kg. Weight - 16kg per set of 4. Non returnable.